In my last Pathology blog post, I talked about WordPress, the software we use to run our blogs, and how easy it makes maintaining content on a Web site or blog. What about reading and keeping up with blogs? There are millions of blogs covering almost as many topics: government, health care, news, politics, education, knitting, food, cats and every other subject of possible interest to humans. It can be overwhelming to try and follow even a handful of favorite sites. Many Web sites, especially blogs, use a Web service called RSS, which stands for Really Simple Syndication (or sometimes Rich Site Summary). RSS is a “feed” that contains the latest information about a blog post, such as the author, time and date of publication and a summary of the article. When a blog post is published, that site’s RSS feed is automatically updated. To follow a blog’s RSS feed, one must subscribe to that blog using an RSS reader, or “feed reader.” A feed reader will keep track of the sites that you follow, and automatically check for new articles/posts/content. On a site using RSS, there is usually a link or button that says “Subscribe,” “RSS,” “Follow us” or similar. This blog has a link in the footer, as do most WordPress sites. Also, look for the orange syndication symbol shown at the top of this post. Microsoft Outlook, our mail client, can subscribe to RSS feeds and have them delivered to the in-box. There’s a tutorial on the MicroSoft Web site. Most Web browsers usually offer built in RSS services (although, sadly, Internet Explorer 6 does not). I prefer Mozilla’s Firefox (free download) to all other Web browsers. When visiting a Web site that has an RSS feed, the orange syndication symbol appears at the end of the address field. Clicking the orange square will add this feed to Firefox, or allow me to choose another service. I follow hundreds of blogs on a wide range of subjects. For me, Google Reader works well – the headlines accumulate until I have time to look through them (usually in the middle of the night). Because it’s a Web based service, I can access those feeds from any computer, or my phone. It’s also possible to have your favorite feeds show up on your Google home page, if you use one. Yahoo provides a similar service, as does Bloglines, and you can also follow RSS feeds on a Blackberry or iPhone. 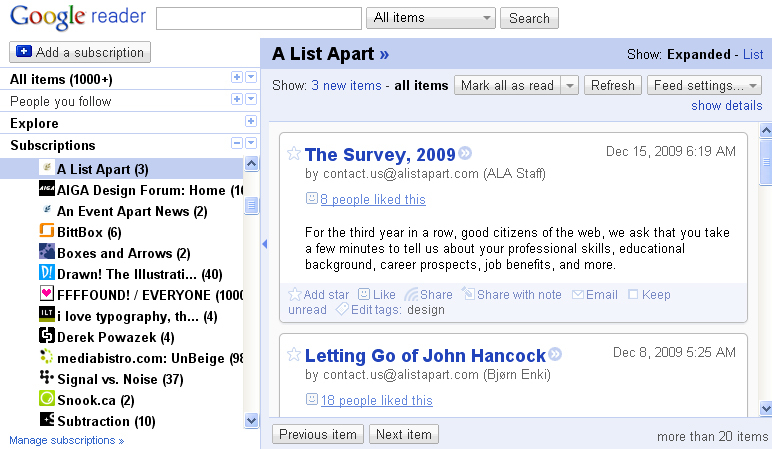 Google reader also allows me the organize blogs into categories, and to share certain posts with my contacts and friends. I can also preview the blog post in the right hand pane, which saves a lot of time. 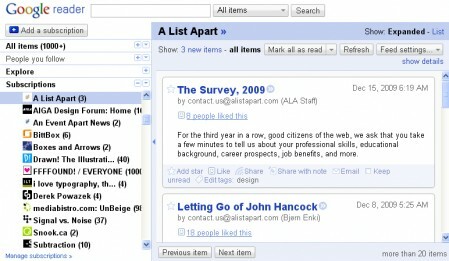 I often read the posts inside of the Google reader, instead of visiting the blog itself. Other Web sites besides blogs use RSS, too. Wikipedia entries have their own feeds, as does CNN, NPR and the New York Times. Podcasts are also a form of syndication through iTunes. You can track your friends’ updates on Facebook or Twitter, as well. That, however, is a subject for a future blog post. If you have questions about blogging or RSS, please leave me a comment below.